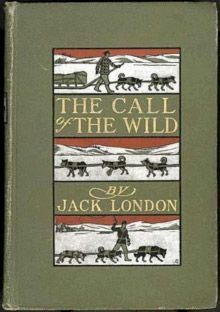 Perhaps no other book is as synonymous with Alaska and the Yukon as Jack London’s seminal work The Call of the Wild. This timeless story about the journey of Buck, an Alaskan sled dog during the time of the Klondike gold rush, still attracts visitors to the Last Frontier despite being written over 100 years ago. But what did things look like back in 1903 when London penned his classic, and what do the aspects of his book look like today? Let’s take a look into the enchanting world of Call of the Wild. 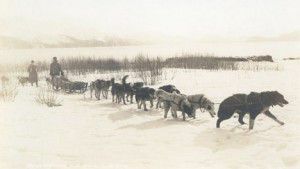 Sled dog teams like the one pictured here were commonly used in the 19th century to deliver mail and other important shipments to far flung Alaskan towns. Native Alaskans continued to rely on sled dog teams until the 1920s, when flight became the preferred method of travel. Today, the Iditarod is the best way to celebrate Alaska’s rich tradition with sled dogs. This grueling race from Anchorage to Nome is the most famous event of the year in Alaska. 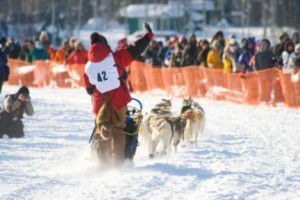 People from all over the world visit the state to catch a glimpse of the courageous mushers and dogs as they travel across the 1,049 mile trail. When gold was found in Klondike in 1896, a rush ensued that attracted over 100,000 people to this remote region of the Yukon. 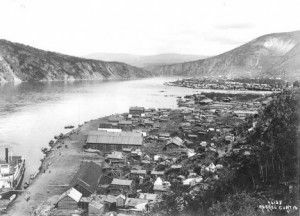 This led to the founding of Dawson City, which became the home base for thousands of hopeful prospectors during the gold rush. Nowadays Klondike is a peaceful town on the Yukon River. It’s a popular tourist destination, with old-style architecture and plenty of relics from the heydays of the Klondike gold rush. 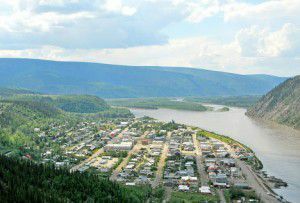 Plan a Dawson City vacation and see first-hand what this quirky town was like during the madness of its founding days. 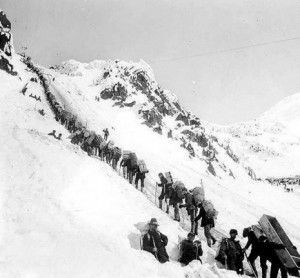 The world was captivated when newspapers began publishing photos of the prospectors’ trek over the Chilkoot Pass, the most treacherous point on the journey from Alaska to Dawson City. Today, the Chilkoot trail is a popular hike in the summertime for residents and tourists alike. 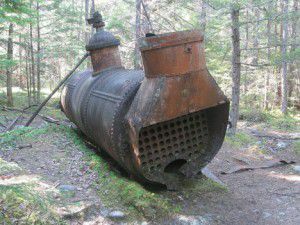 The 33-mile route is well-maintained and littered with fascinating leftovers from the gold rush era, like this abandoned locomotive engine shown above. Whether you’re an avid Jack London fan or never read any of his books, the region of The Call of the Wild is enchanting to this day. Make sure to pay a visit to this spectacular corner of the Last Frontier.